Should PetRescue be taking donations at all? "Tall poppy syndrome"; not a gross misuse of funds intended for animal care. 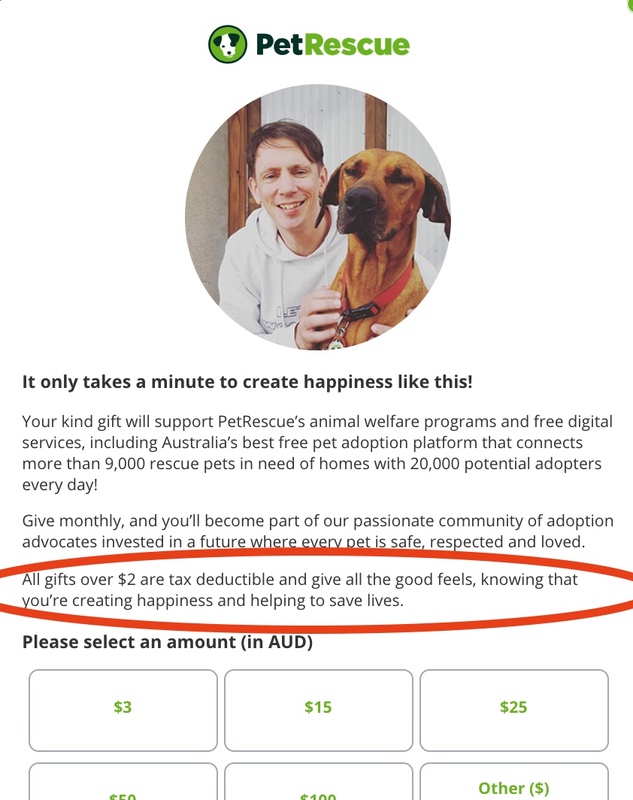 PetRescue clearly doesn't feel its done anything wrong in running aggressive fundraising campaigns and taking hundreds of thousands of dollars a year out of the animal rescue movement, using the images of animals it has never met, nor intended to contribute to financially. However, if PetRescue has never met these animals, it lends itself to the question; why is PetRescue allowed to take donations at all? To solicit donations and be able to offer the "gifts over $2 are tax deductible" incentive, an organsation needs to be endorsed by the Australian Tax Office (ATO) as a Deductible Gift Recipient (DGR). PetRescue is endorsed as a DGR as an animal welfare charity . - rehabilitating orphaned, sick or injured animals (but not only native wildlife) that have been lost, mistreated or are without owners. PetRescue describes itself as a “digital animal welfare agency” and provides no "short-term direct care to animals" - neither do they "rehabilitate orphaned, sick or injured animals". So what gives the ATO the idea that they do? 3.1.1 The primary object of the Company is to rehabilitate orphaned, sick or injured domestic animals that have been lost, mistreated or are without owners and to reduce the number of orphaned, sick or injured domestic animals that have been lost, mistreated or are without owners that are euthanized, by rehoming those animals. (c) creating new volunteer foster care groups to enable the retrieval of orphaned, sick or injured domestic animals that have been lost, mistreated or are without owners from impound facilities and for their rehabilitation and care in temporary foster homes, until such time as permanent homes can be identified and recruited. - "identifying and recruiting permanent adoptive homes"
- "creating new volunteer foster care groups"
So in order to meet the ATO DGR requirements to be "providing short-term direct care to animals", or "rehabilitating orphaned, sick or injured animals" PetRescue has redefined what that even means. A virtual animal rescue group! "Caring" for animals, it's never met. "Rehabilitating" animals it contributes nothing towards. PetRescue clearly does not intend to change its fundraising strategies, so maybe the community has to resist in a more foundational fashion; asking the ATO to close this loophole and require that animal care charities care for actual, real-life pets. If you're a rescue group frustrated that you're losing animal care donations to a charity who does not care for pets, you can contact the ATO anonymously, via their website using their tax evasion reporting form.